Beautifully designed HealthCraft Easy Mount™ Grab Bars can be installed virtually anywhere in the home to provide support. Grab bars are the first step in creating a safer bathroom environment. 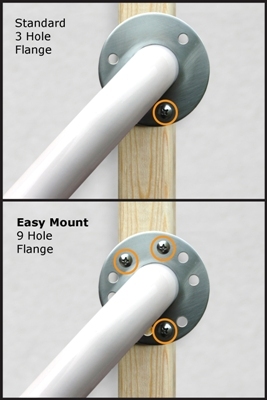 Unlike 3 hole flanges that limit screw placement, HealthCraft’s innovative 9-hole Easy Mount flange design allows for greater mounting flexibility to structural studs. Also compatible with specialized grab bar fasteners and anchors that mount directly behind drywall, tile and other surfaces should stud spacing not permit direct mounting. Stainless steel construction ensures that these grab bars will never rust. A simple wipe with a damp cloth is all that is required to maintain a clean attractive finish. Concealed Screws. Flange covers conceal the screws creating a more seamless and attractive look. All HealthCraft grab bars meet or exceed the guidelines of the Americans with Disabilities Act (ADA).